Italians adore coffee the way the French love their two-hour lunches. Have you ever heard so many names for coffee? We have espresso, latte, cappuccino, frappio, doppio, etc. With the harvest season immersing our senses with warm colors and spicy fragrances, flavoring our coffee with such is a welcome expectation. Here is my spin on Pumpkin Pie Lattes and Pumpkin Pie Frappio-Doppios using Folgers Coffee (my husband prefers Colombian, but sometimes all I can find is the Classic Roast). You can use whatever brand you have on hand, but I am warning you…instant coffee does not work; you will end up with a bitter drink. First, brew enough coffee to make your drinks, make it double strength. For instance, I used one scoop per each cup of coffee, as that is STRONG for us. If it is for Lattes, leave it hot. If it is for Frappio-Doppios, then pour it into a container and freeze it for a couple of hours before using to make it either very cold or slushy. 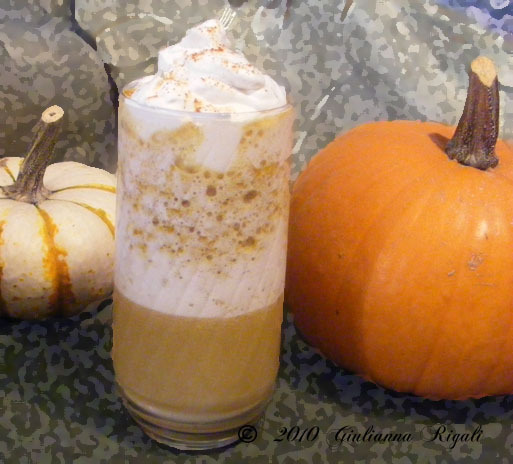 Optional: Whipped Cream, spices, and/or a cinnamon stick for the finishing touch. 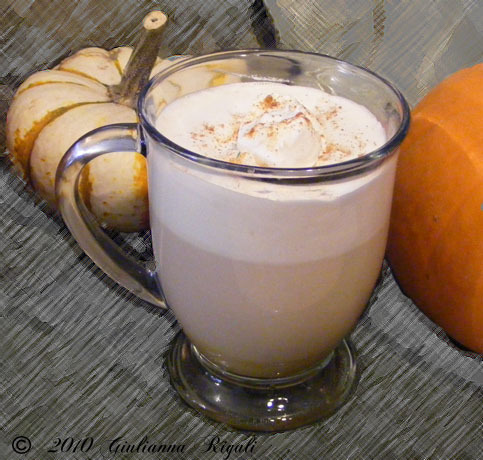 In a small saucepan, heat the milk, pumpkin, sugar, caramel, and spice until steaming hot. 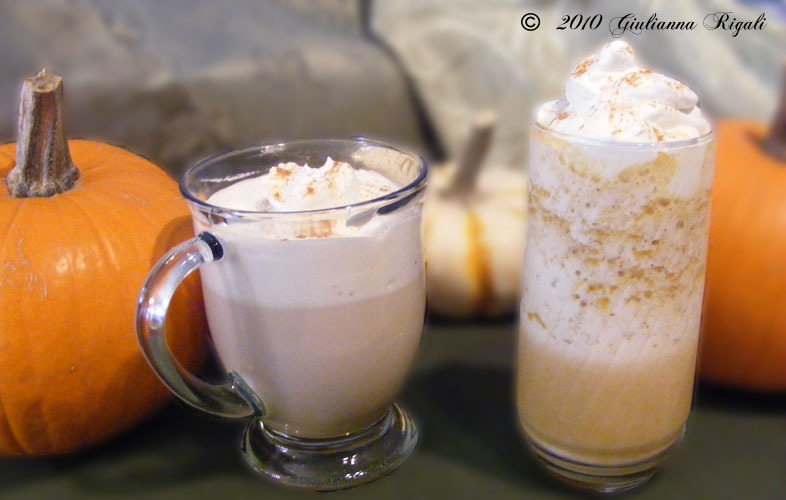 Place milk/pumpkin mixture into a blender and frappe until frothy. Divide between two mugs and then pour ½ cup of coffee into each. Top with whipped cream, pumpkin pie spice and a cinnamon stick. Optional: Whipped Cream, spices, and/or cinnamon sticks for the finishing touch. Place all ingredients in a blender and frappe for 30 seconds. Stir or shake blender and then frappe for 30 more seconds. Pour into glasses and top with whipped cream, pumpkin pie spice, and a cinnamon stick.